Yesterday’s New York Times article on Europe’s efforts to shore up transportation alternatives at the expense of driving stirred up a lot of conversation around the net – including right here on The Source. Our informal poll asking readers whether the agree with European transportation policy racked up over 170 votes since it was posted. The overall feedback from readers? 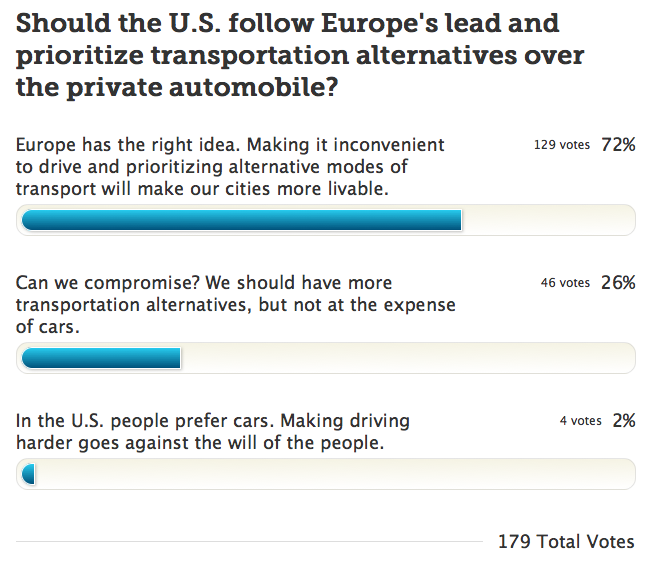 The majority (72%) agree that it’s worth inconveniencing the private car to encourage more alternatives. A smaller percentage (26%) think that we should invest in more transportation alternatives – but not at the expense of cars. Of course, that begs the question: is it possible to make alternatives attractive when policy makes driving super convenient? Only 2% feel that the U.S. way is the automobile, and it’s best to leave it that way. Of course, our readership is biased – according to our Reader Survey, over 70% of our readers are regular transit riders. Opinions may vary on L.A. hot rod enthusiast blogs. The poll is still open, so please feel free to add your two cents. And after the jump, a few highlighted comments from readers. Y Fukuzawa thinks that the argument forgets one important element: not-quite cars, aka scooters and motorcycles. Connor Gilliland thinks there needs to be another option in our poll because he doesn’t feel cars should be inconvenienced with hostility (as the Times article put it) but only if it serves to improve transit. The goal here should be, not to directly hurt traffic as an intention, but to improve transit, with a possible side effect of affecting traffic because it then means transit can be maximized. Not prioritizing transit over cars would be the wrong approach and yet that is what LA has been doing for decades despite already having thousands of miles of paved roads and a colossal freeway network. It’s worth pointing out that part of the reason Europe is less car orientated is because it is a historic continent. Many of the cities are hundreds of years old and were simply never designed to accommodate motorised vehicles. My city, Edinburgh in Scotland has the best rate of public transit usage in the UK outside of London (and that’s buses only – we don’t have a tram or subway system) and that is because Edinburgh is such a difficult place to drive in: we don’t have parking lots everywhere and most of the roads are only two lanes wide which can’t take much on-street parking. LA being such a new city was obviously designed very much with the car in mind, but the planners of the day could never have foreseen just how popular and accessible private motoring would become and the problems this would bring. This does however present incredible opportunities for developing mass transit in LA: wide, straight roads that don’t preclude the use of certain size buses and that could accommodate bus lanes or tram lines; an easily navigable gridiron pattern of blocks that means buses don’t have to go round in circles or double back on themselves; plus LA has the advantage of having good weather: people in Scotland don’t always want to go out to a bus stop if it’s freezing cold and/or raining! All of this is irrelevant though when one considers the bottom line fact: oil is running out. Fuel/gas is going to get a lot more expensive. The days of ‘predict and provide’ road building are over. Mass transit is the solution for the future. Mass transit is good for those that need and like it. As for myself, give me my comfortable, safe car with cool air conditioning, soft, smooth ride while listening to my multi-speaker Sirius Radio, and the ability to go where I want, when I want, and on time. I’m not sure where these people live that always complain they can’t walk. It’s not that walking is difficult, it’s that people tend to not want to walk more than a 1/4 of a mile. Aggrivating drivers isn’t going to make lazy people any less lazy. I’ve got friends in their 20s and 30s that can’t be bothered to walk half a mile and wouldn’t be caught dead on a bus. All the bike lanes and pedestrian paths and bus lanes aren’t going to change that. As for Connor’s rant against the “collosal freeway network,” I must remind everyone that only half the plan was ever built. Maybe if the rich NIMBYs in Beverly Hills and Laurel Canyon hadn’t blocked those freeways it wouldn’t take a hour to commute to and from a job on the Westside. The same goes for the rich NIMBYs in South Pasadena who block the 710 and force all that traffic through Downtown and East LA forcing low income people to choke on excess pollution from stop and go traffic. If we had built the original system, we wouldn’t have to have 12 lane wide monstrosities with massive interchanges since traffic would be more dispersed. Don’t think I’m some crazy car nut, I’m not. I walk, ride the bus, ride rail and also use my car. Transit is nice and it has its place, but trying to change reality and punish people who are simply trying to get to work because it doesn’t fit a utopian world car hating view is simply misguided. Would you feel the same if you paid the true cost of driving, that is, paid the true cost of gasoline, parking and pollution? Namely the idea that, while I think it’s wrong to be hostile to the private automobile, we ARE actively hostile (and have been for a long time) to other modes. All you have to do is look at the incomplete freeway network and compare it our rail network (the closest transit approximation to a grade separated freeway). One if far, far more vast than the other. I’ll let you guess which one. The hostility comes into play in a number of ways. Take many of our light rail lines – in many European countries light rail is given full right of way, even when it runs at grade. Many European cities close off streets to cars leaving them open for light rail and pedestrians only. In the U.S. our light rail must share busy streets with cars and more often than not give cars priority, or at the very least equal standing – no matter if doing so significantly reduces the advantages of light rail transit. Another blatant display of hostility in my opinion is from the pedestrian level. To me walking is the most basic and fundamental form of mobility – it’s what almost all of us (excepting the physically disabled, very young and very old) can rely on. Yet while automobiles get wide boulevards, long green lights and high speed limits, pedestrians get narrow, cracked sidewalks, short crosswalks and in almost every way must heed to the mighty automobile. When I’m walking, that’s when I feel the true hostility that our transportation and urban policy has against other modes. The streets are most unfriendly to those who are not in automobiles. That’s not to say I find the freeways and streets of L.A. fun to drive on – on the contrary, driving in L.A. is so stressful and horrible it’s the main reason I’ve lived without a car for 6 years. But that’s why I think continuing to invest in making things easier for driving is a mistake. If any place has invested in accommodating the private car, it’s Los Angeles, and yet for most people driving in L.A. is not a pleasure, it’s a pain. The simple fact is that cars require vast amounts of space and infrastructure, and they encourage development patterns that require yet more cars. After a certain point those demands become unsustainable. The result, in a high population region like Los Angeles is traffic, congestion, pollution, blight, sprawl, long commutes and isolation. So the question is, do we continue trying to prop up this unsustainable scheme? More lanes that beget more cars that beget more traffic that beget more lanes and on and on? Or do we attempt a new policy that is perhaps more inconvenient (walking does require some physical labor) but more sustainable? From NY, yet studied in LA and now been here for about 15 years. I love it and mass transit, yet its just not for everyone. I work in sales and have to go to calls to accounts that mass transit doesn’t serve or will never (because of various reasons). I need to be on time all the time or I don’t get paid. So here we go, lets build out a good solid, smart network that allows people to connect. Give people options and NOT FORCE THEM into anything (this is a free country still, right?). People never like to be forced to do anything. Make our transit system smarter, safer, and more on time and I bet your ridership will go up. Both on Trains and Buses. While I do agree that most people here in the US do not want to walk 1/4 of a mi, but there’s also the fact that we designed our cities with acre-sized Walmarts, Targets, BestBuys, etc. etc. that even walking 1/4 mi you still see no change in scenery that walking becomes dull and boring. Compare that to places like Europe or Asia, where walking a 1/4 of a mi gets you access to many different stores and sights to see. The same can be said in places like Boston and New York; you walk 1/4 mi in New York and you could see a lots of things going on between Times Square and Rockefeller Plaza. You don’t need to walk 1/4 mi to pass by a BestBuy or CVS Pharmacy in Boston because they built them compact and upwards. In contrast over here, walking a 1/4 mi you would likely be still in the parking lot of a K-Mart. All great points, yet LA was set up different then NYC (I am a NY’er invading for 15 years now-LOL). NYC is a perfect grid. We even have Rivers that allow our feeder trains/ferrys to get people out to the burbs; almost perfectly. LA, is a beast I don’t know Mass Transit can grasp (yet at least cuddle, hug, and hold). My feeling is lets keep what we have going with the last measure and build from that. Metro and US as a community need to build on that people want something other then getting in their car; maybe they don’t give up the car, yet they will leave it home “sometimes”. Imagine what Rudy did with Times Square and NYC in the 90’s (Place was the worse during lunch time-then things changed with enforcement of the laws). LA can do that too–Everything shot up: JOBS, housing, etc…and Crime shot down. Wanting to see LA grow and build. Lets get people back to work, lets get people faster to where they need to go, and lets all have a better life. LA is the way it is due to there being a plethora of cheap land and a very good inter-urban railway (Pacific Electric-Red Car) and very good city streetcar (LARy- Yellow Car) network with which to access it. Don’t let the gasholics convince you otherwise. It was the state’s construction of the Marxist “Free”way system that destroyed the above-mentioned capitalist enterprises.